Make the most of cranberries while they are in season. Their tart flavour contrasts perfectly with Cointreau-soaked sponge, custard and fresh cream. Place the cranberries in a small pan with 150ml cold water, reserving a few for decoration. Bring to the boil, then simmer uncovered for 5 minutes. Stir in 100g of the sugar. Simmer for a further 10 minutes, until the fruit is tender. Allow to cool slightly. Arrange the sponge fingers in a large glass trifle dish and pour the Cointreau and orange juice evenly over. Spoon the warm cranberries on top and leave to cool. Pour the cream into a small pan. Scrape out the seeds from the vanilla pod with a knife and add the seeds and pod to the cream. Place the pan over a low heat and bring to a simmer, then remove from the heat and discard the vanilla pod. Place the egg yolks, cornflour and the remaining sugar in a heatproof bowl and pour the warmed cream over, whisking continually. Pour the mixture back into the pan and whisk over a low heat, until the custard thickens. Allow to cool slightly. Pour the custard over the cranberries and sponge, cover with a circle of damp greaseproof paper and leave to cool. Whip the cream for the topping, until it holds its shape. Remove the greaseproof paper and lightly spoon the cream over the custard. 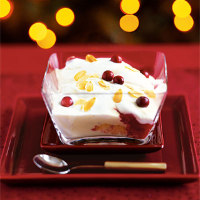 Decorate the top with the reserved cranberries and toasted almonds, if liked.